Dr. B. R. Shetty is a pioneer in the private Healthcare industry of the UAE. He is the founder of NMC Healthcare (in 1975), as the largest private healthcare provider in UAE, and is listed on the London Stock Exchange. Over the last four decades, NMC has grown to over 40 facilities across 5 countries, treating over 11,000 patients a day. Dr. Shetty also ventured into distribution business with 'NMC Trading' in 1976 as the largest distributors in the UAE, being the exclusive marketer of iconic brands such as Nestle, Unilever, Nivea, Pfizer, Siemens, Samsung, Henkel, Abbott, 3M, and among many others across the verticals of pharmaceuticals, medical devices, consumable sand equipment, personal care, food and beverage, household care, veterinary, education and stationery products. Dr. Shetty is also the Chairman of UAE Exchange, the market leader in money remittance services across the world. UAE Exchange has over 800 branches in more than 30 countries, around the world and was responsible for over 12% of all inward remittances into India, last year. In 1999, UAE Exchange launched Xpress Money, a global money transfer brand with presence in more than 150 countries, and over 200,000 locations around the world. In 2014, Dr. Shetty acquired Travelex, the leading foreign exchange specialist worldwide with 1,500 stores and over 1,300 ATMs in 27 countries. Apart from healthcare, distribution and financial services, Dr. Shetty has founded Neopharma, Abu Dhabi's premier pharmaceutical manufacturing facility with branded generics and partner manufacturing for Pfizer, Merck Serono, Abbot and Biocon. He also owns Royal Catering, one of Abu Dhabi's largest catering companies, and runs schools educating over 25,000 students across Abu Dhabi and Dubai. Dr. Shetty is passionate about serving the community, and, has been a leading philanthropist. He is recipient of the Order of Abu Dhabi; the highest civilian award bestowed, by the Government of Abu Dhabi and the Padmashri Award, bestowed by the Government of India. 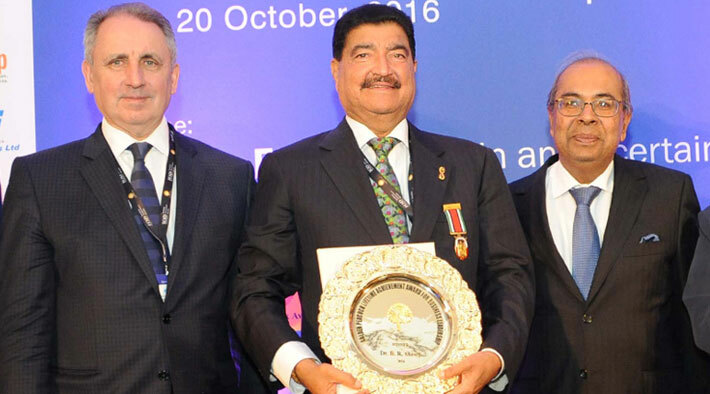 In addition, Dr. B. R. Shetty is the Chairman of the Indian Business and Professional Group (IBPG), and the Vice President of Swiss Business Council, Abu Dhabi.